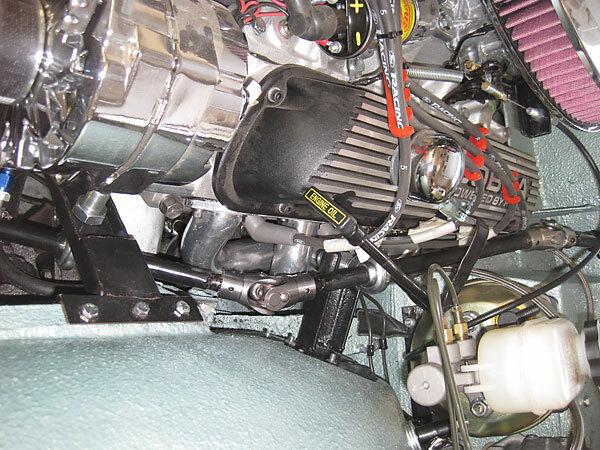 Engine: Factory Ford 302 crate engine (rated 350hp.) 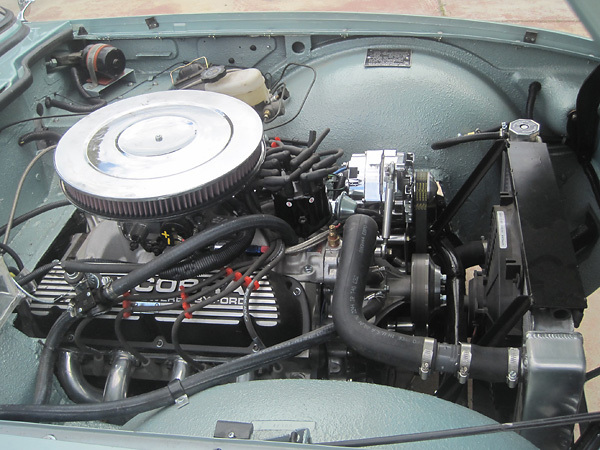 Edelbrock RPM aluminum heads, with 60cc combustion chambers and bronze guides. 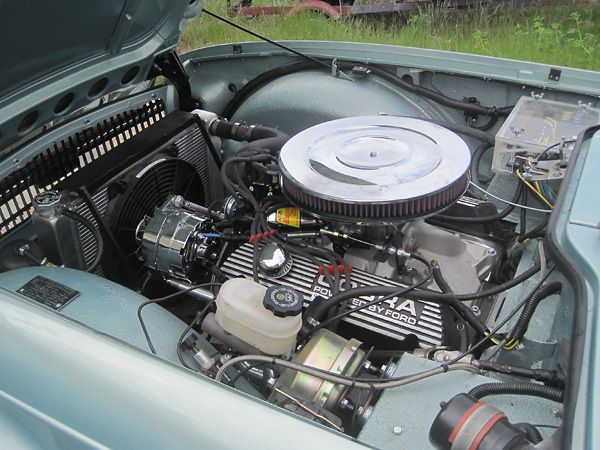 Cobra Powered By Ford aluminum valve covers. Dan Masters style motor mounts. Edelbrock Performer intake manifold. Edelbrock 600cfm carburetor with electric choke (model 1406). Edelbrock electric fuel pump. Pertronix Flame-Thrower II Billet Distributor (model D130710). 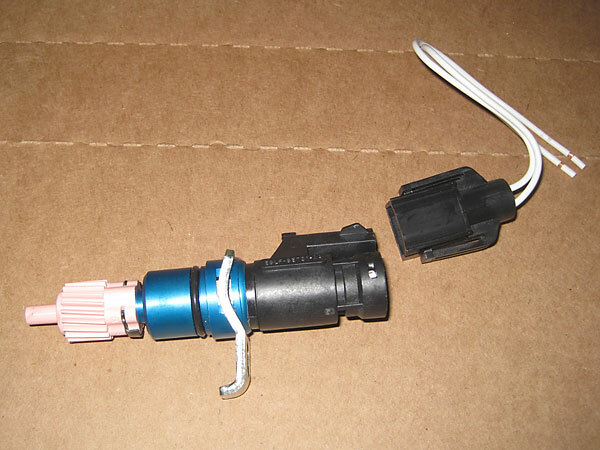 Accel Super Stock ignition coil. Ford Racing spark plug wires. Serpentine fan belt. 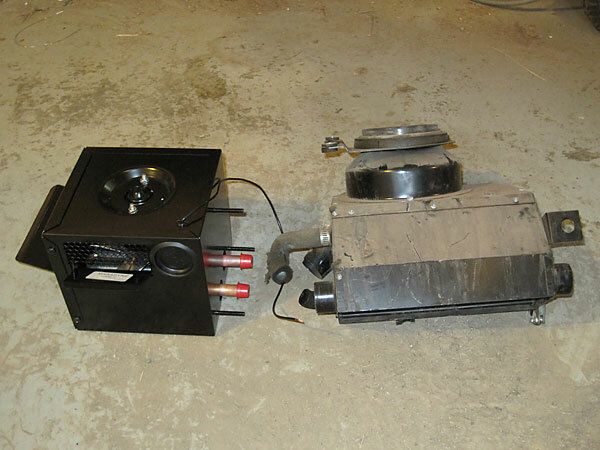 Cooling: Griffin aluminum radiator with 14" Pro Air electric fan (pulling). Exhaust: Speedway Motors Tight-Fit 4 into 1 AHC coated (inside and out) headers. Dual Dynomax Turbo 18" mufflers. 2" exhaust system. 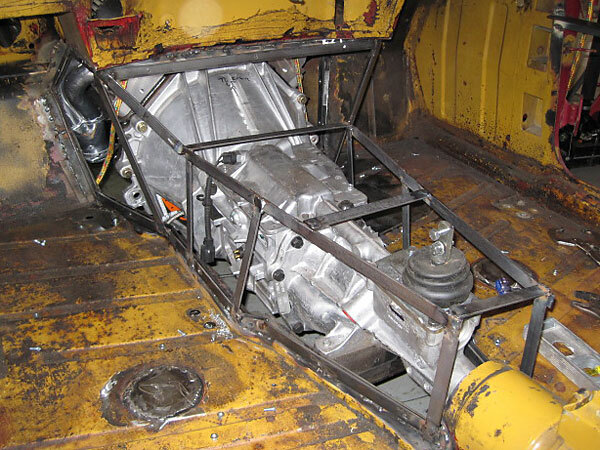 Transmission: Tremec T5 5-speed. Centerforce clutch. Wilwood clutch master cylinder. Tilton hydraulic throw-out bearing. Rear End: Goodparts modified Nissan R200 viscous limited slip differential. Goodparts axles and rear hubs. 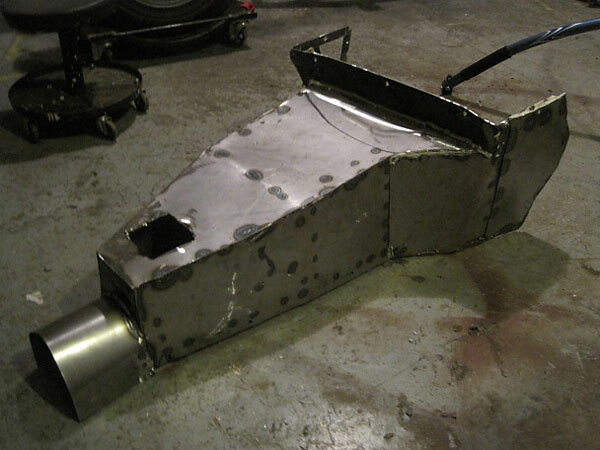 Chassis: stock frame with a few reinforcements. Body lifted 5/8" via hard rubber spacers. 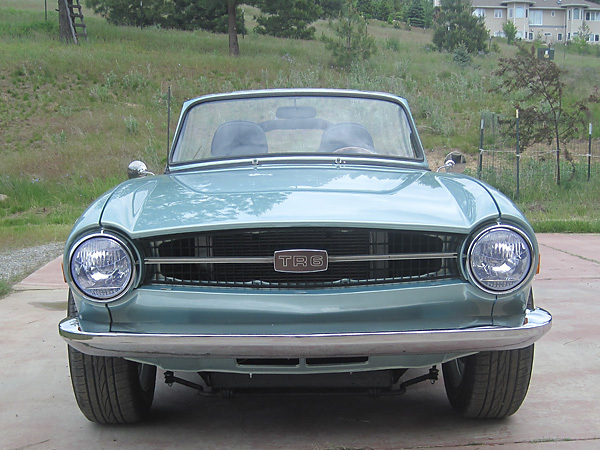 Front Suspension: new spindles. Synthetic bushings. KYB shock absorbers. Goodparts lowered (stiffer) front springs. Woodward steering shaft with three u-joints and two Heim joints for support. 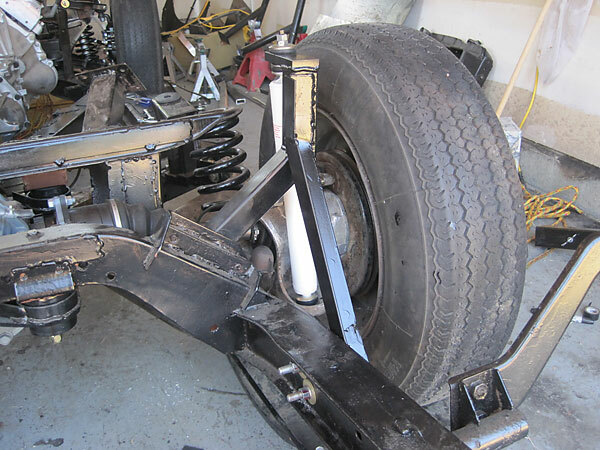 Rear Suspension: Goodparts lowered (stiffer) rear springs. KYB Gas-a-Just shock absorbers. Synthetic bushings. Blind Moose rear shock kit modified with extra support arms. Brakes: MP Master Brakes master cylinder and booster with Wilwood proportioning valve. American-thread brake lines (adapter to British threads is Edelmann #272330). Wilwood front brake calipers. Wilwood 10.75" x 0.81" solid rotors. 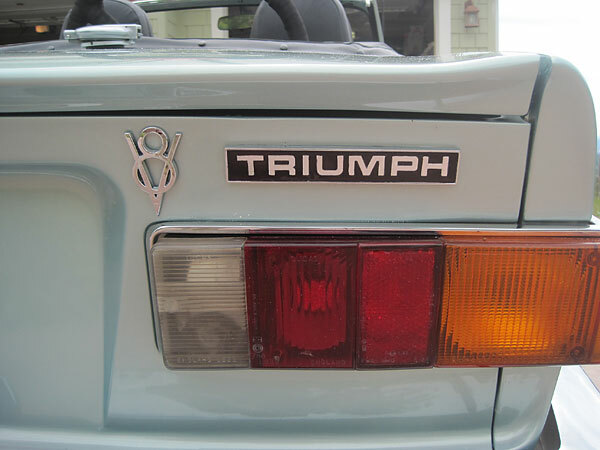 Stock Triumph TR6 rear brakes. Wheels/Tires: Konig Rewind 16" aluminum wheels with Falken ZIEX ZE912 V-rated 205/65/16 tires. Instruments: Autometer Old Tyme electronic gauges (left to right) speedometer (0-120mph), tachometer (0-8000rpm), coolant temperature (100-250F), oil pressure (0-100psi), clock, fuel level (used with stock Triumph fuel level sender), voltage (8-18V). 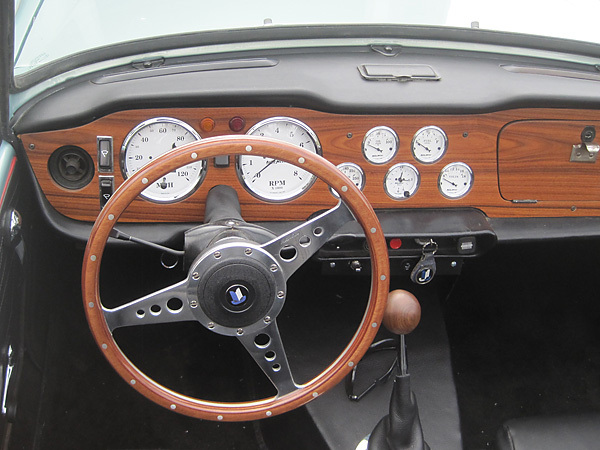 Interior: MotaLita steering wheel. Mr. Roadster gas pedal with Lokar cable. Stock clutch and brake pedals are bent to the left. Hurst gear selector. 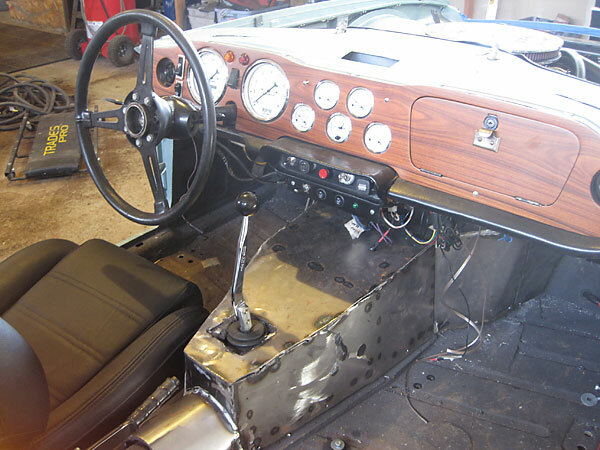 Miata seats with integrated heaters and speakers. Lizard Skin sound spray, Lizard Skin heat spray, and acoustic mat. Maradyne 5000 heater mounted above passenger-side footbox. Body Mods: shaved stock front turn signals. 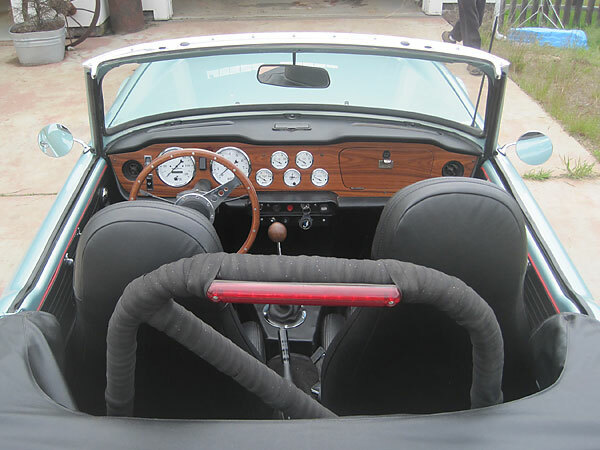 Four point roll bar with 3rd brake light. 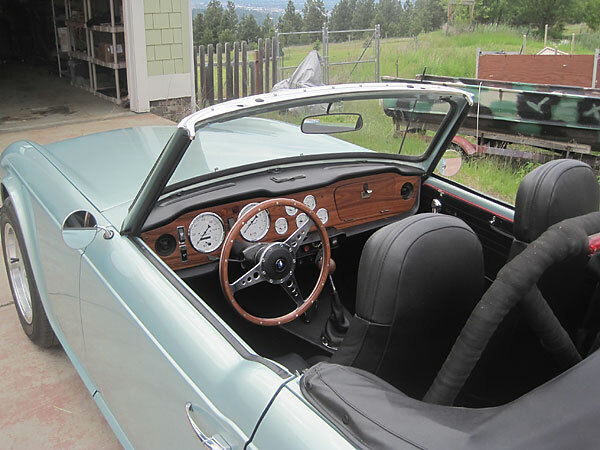 Paint and minor cosmetic bodywork by Anderson's Collision of Spokane Washington. 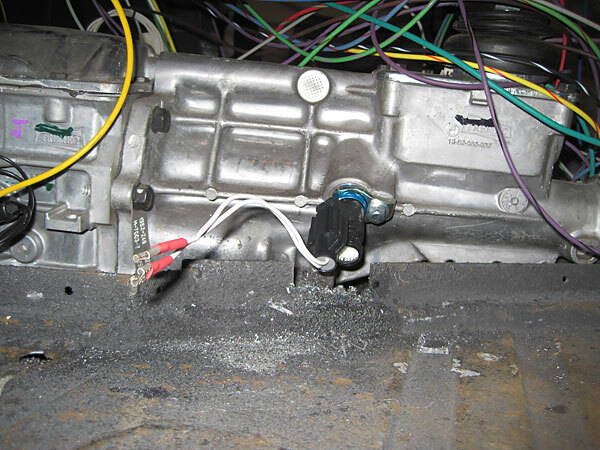 Electrical: Advance AutoWire wiring harness. Delco-style single wire alternator. Battery in trunk with gauge 2 cable. Mustang inertia switch. TPI Tech 7" halogen (H4) headlights with built-in LED turn signal / parking lamps. Completed: May 2011. 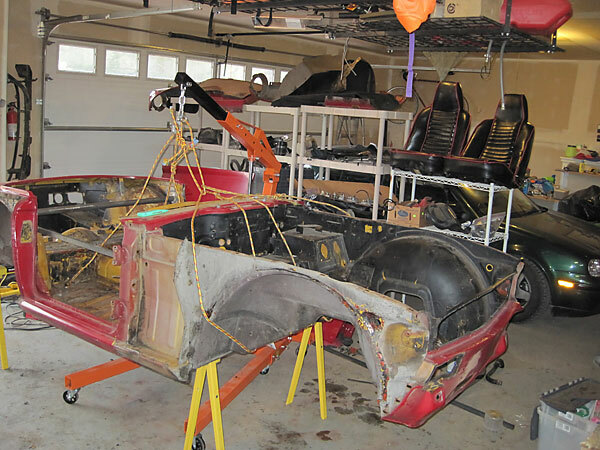 The conversion project took seventeen months, start to finish. 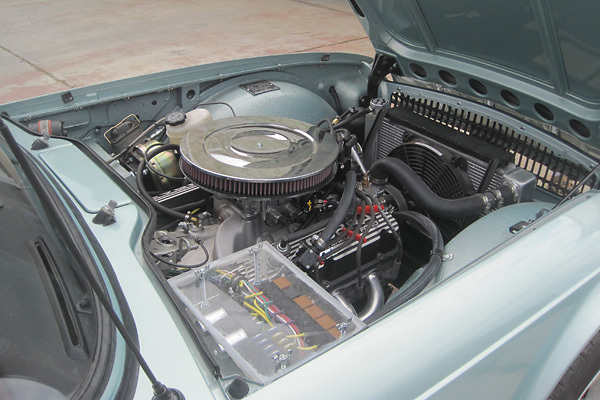 his hood with any sort of bulge or scoop over the carburetor. he lost space for the pedals and the cabin is tighter. 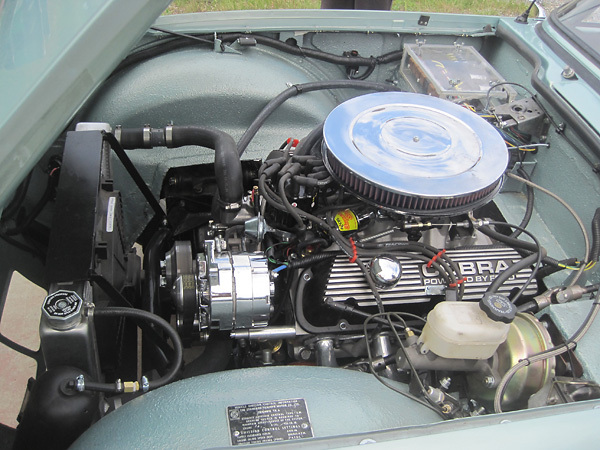 Cobra Powered by Ford aluminum valve covers. MP Master Brakes master cylinder and booster with Wilwood proportioning valve. 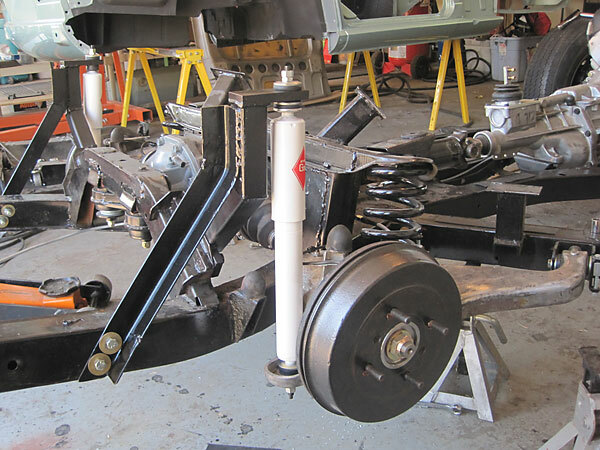 Woodward steering shaft with three u-joints and two Heim joints for support. Griffin aluminum radiator with 14" Pro Air electric fan (pulling). Advance Auto-Wire electrical center, as originally developed by Dan Masters. 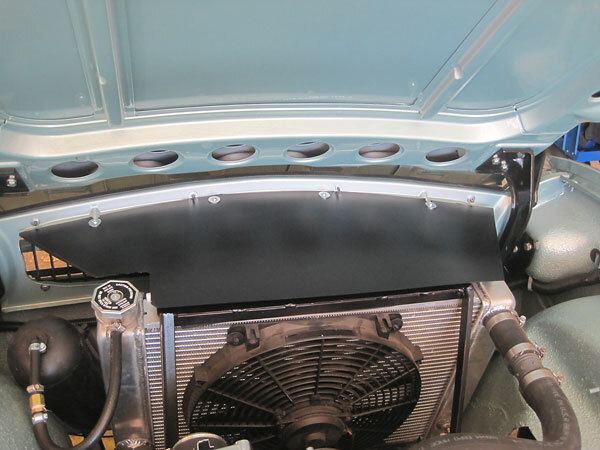 A finishing touch: George added a Lexan cover from cowl to the radiator for better airflow. 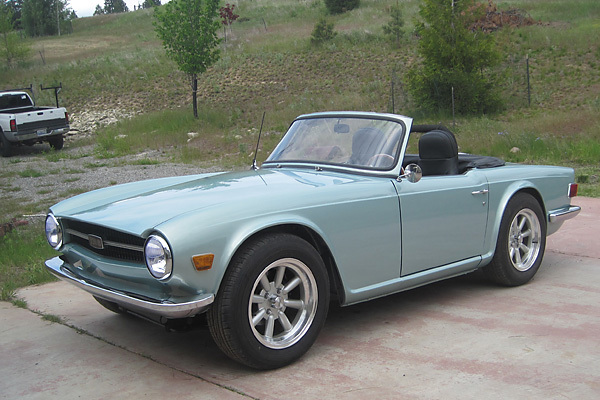 The engine runs at an indicated 180-185 degrees F.
A cherry picker can be used to lift the TR6's body off its frame, or to move it around. 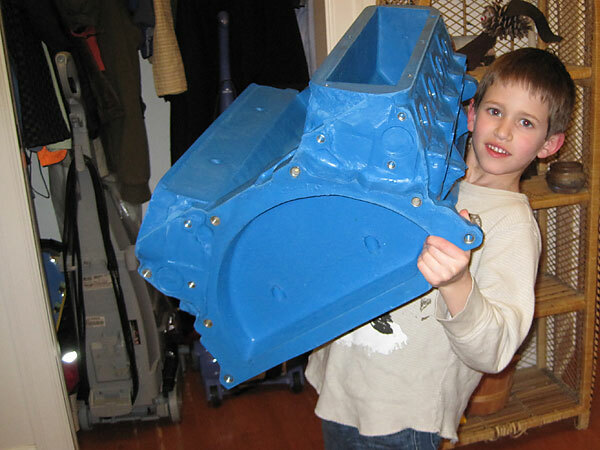 PAYR lightweight plastic engine blocks are handy for more convenient mock-ups. Dan Masters style motor mounts. 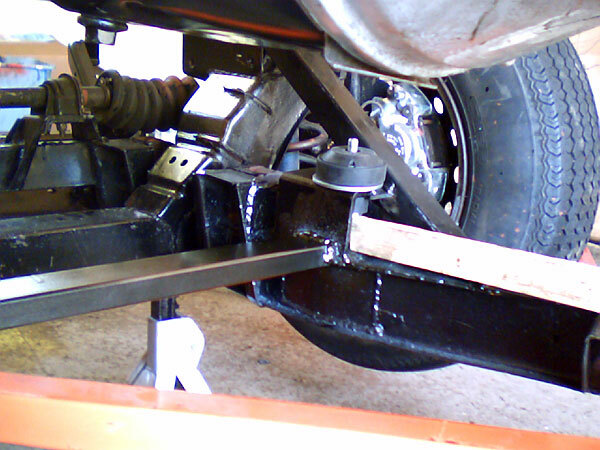 Transmission support bracket, added between the frame rails. Sender for a digital electronic speedometer. 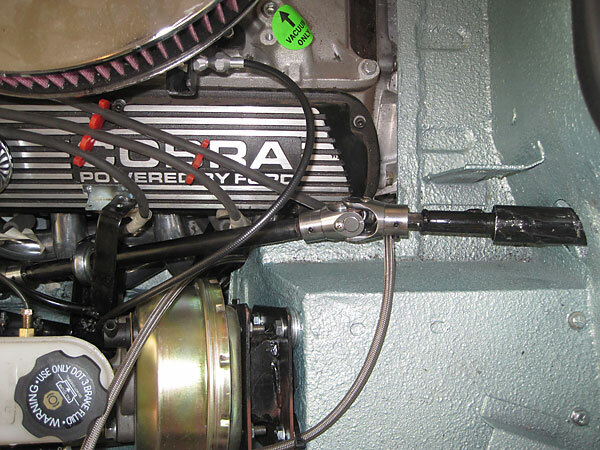 Installation of the speedometer sender on the Tremec five speed transmission. Wilwood front brake calipers. 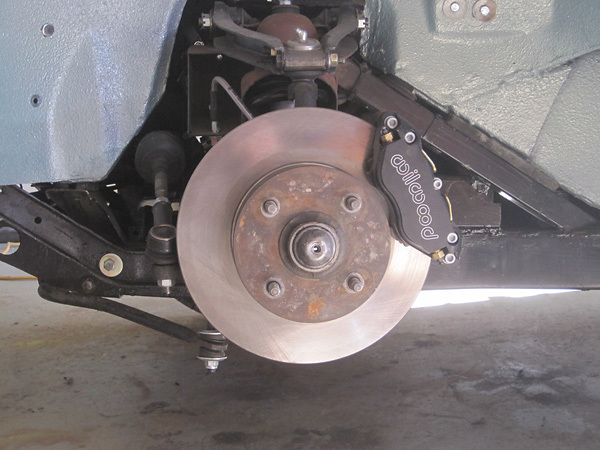 Wilwood 10.75" x 0.81" solid rotors. less than stock due to lowered springs. KYB Gas-a-Just shock absorbers. Goodparts lowered (stiffer) rear springs. Blind Moose rear shock kit modified with extra support arms. coolant temperature (100-250F), oil pressure (0-100psi), clock, fuel level, voltage (8-18V) gauges. 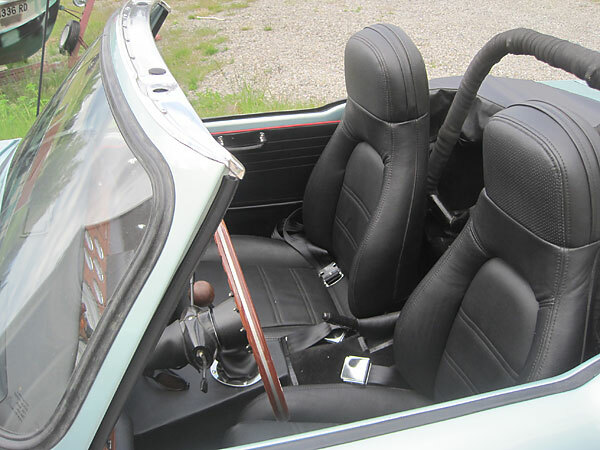 Miata seats with integrated heaters and speakers. 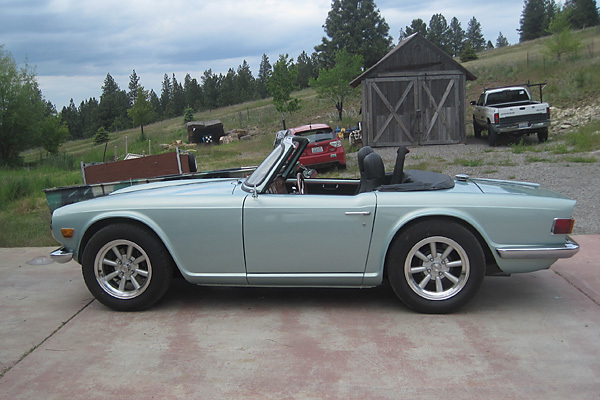 Four point roll bar with 3rd brake light. Mr. Roadster gas pedal. Stock clutch and brake pedals are bent to the left. This photo shows how George designed his custom transmission tunnel in situ. 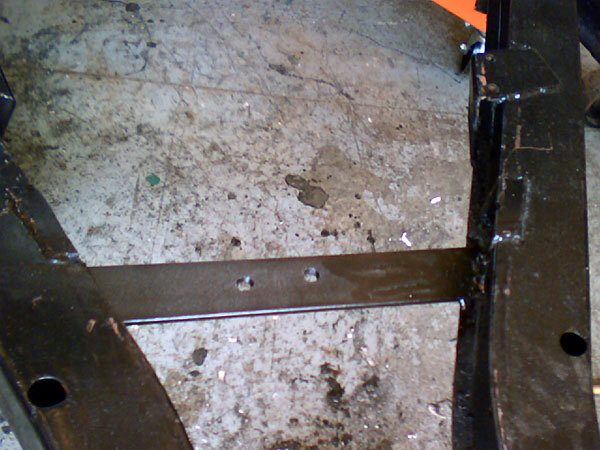 A framework of narrow steel strips defines all necessary seams and bends. 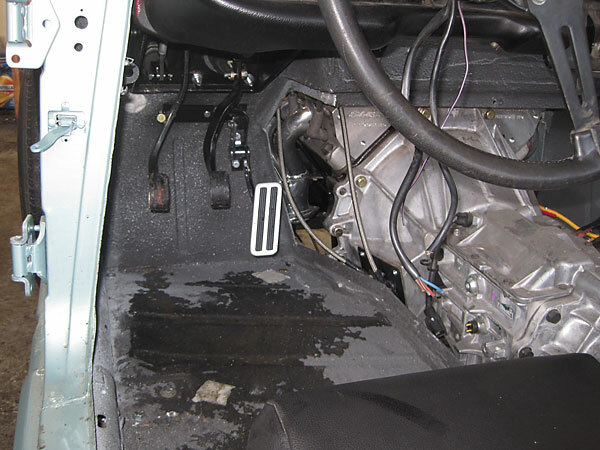 Successful trial installation: the transmission cover is now ready for paint and leather. 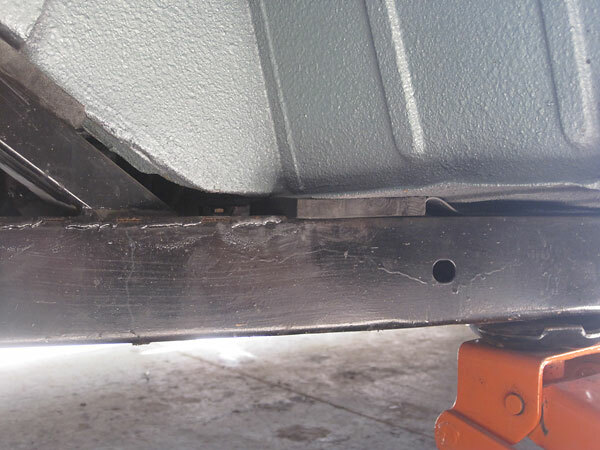 heater and installed it overtop the passenger side footbox. but hired someone else do sandblasting, bodywork, and painting. TPI Tech 7" halogen (H4) headlights with built-in LED turn signal / parking lamps. 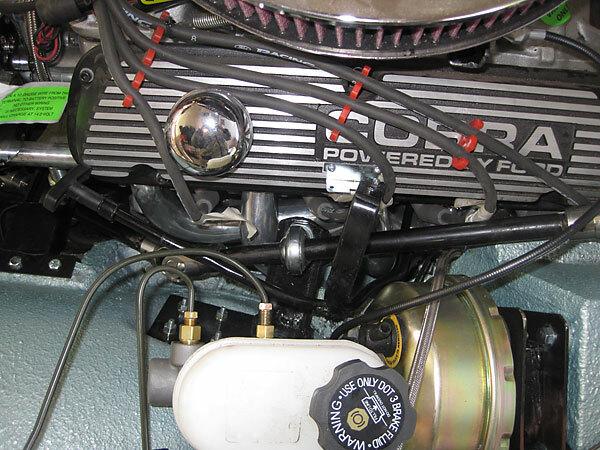 This style of V8 badge suggests that a Ford engine was installed. The photos shown here are were taken by George Smathers for exclusive use by BritishV8 Magazine.